The two piece composite with a smooth connection makes for a great feel on hits and mishits. We’d recommend it for hitters who want a bat with a balanced to light swing weight, a great feel on hits and mishits, as well as a smooth connection. We aren’t the only ones to have information about the 919 Prime. Other places, in particular those who sell bats, usually have a boiler plate write up on the specs of a bat. Many of those we reference to make sure we are seeing what we should be. Here are some more references for the 2019 Louisville Slugger 919 Prime review. Although there are several two piece composite bats on the market today, Slugger’s 919 Prime is one of the best. High School and BBCOR players love the feel on hits and mishits. The performance feels great out of the wrapper. The 919 BBCOR is just like the 918 version. New for 2019, the 919 Prime in the USA Slugger lineup is a welcome addition. Slugger proved they can handle the new regulation with the Solo and Select versions in 2018 (which, according to some, dominated the market). The 919 in a USA Version is likely the most exciting add this year in the USA bat space. As we see it, the 919 in the Big Barrel/USSSA space has never really caught on with travel ball type players in the youth ball space. The bats are good, no doubt, but this version of the 91X bat gets overshadowed by the CF Zens and Marucci CAT 8’s of the world. It’s plenty good enough and comes in a huge range of sizes. There are a few fundamental changes to the 2019 Prime when compared to the 2018 Prime. The grip has changed from the standard Lizard Skin grip to one manufactured by Louisville Slugger. For some this is no reason to fret. A grip is a grip is a grip. And adding a Lizard skin, or any number of grips available on the market today, is easy enough. Rumor has it that Slugger doesn't have the Lizard Skin contract anymore. Slugger changed the connective piece in the 919 from the Tru3 in the 918. This new connective piece is called the VCX. Our hitter's didn't feel much difference in the two bats. The claim is the VCX adds some durability and better weight distribution for the bat. USA Bat: For some, the biggest change in the 91X line from Slugger is the long awaited edition of a two piece composite USA Bat to the mix. This is a huge step in this new market and there should be plenty up for trying it out. After 2 solid hours in the cage with Slugger's 2017 917 Prime in tow we have a good grasp on its total performance, how it compares to it's predecessor and what type of hitter will appreciate this bat the most. The two peice composite bat space is no stranger to competition. Every serious bat company seems to make a really good one in this space. In terms of a similar swing weight and feel on contact look for the 2019 CF Zen and the 2019 Rawlings Quatro Pro. Each of those bats, like the 919, come in a number of sizes and leagues. If you want to be crazy then Slugger sure would like to see you consider their Meta 9 Prime. New for 2019 this is the flagship bat of Slugger’s bat offering. It has some serious upgrades from the 919 Prime and worth a look. If you can believe it, it also costs more. 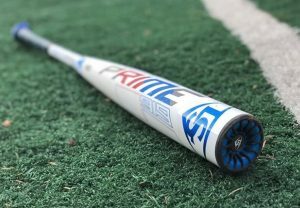 The big buzz this year, we predict, will be the Meta 9 Prime from Slugger. If for anything the fact it our prices every bat on the market by $50. But, the meta is a stiff feeling and massively barreled two piece composite bat. Of course those looking at the 918 will wonder why not save $50 and get the other two piece composite barrel in Slugger’s line up (the 919 Prime). We suspect many will face this dilemma. Ultimately, there are two things you’ll find in the Meta 9 you won’t find in the 919 Prime. If that is worth your $50 we simply can’t tell. The Meta 9 will have a larger barrel than the 919 Prime. Not a crazy amount bigger, but big enough to tell. The swing weights will be very similar. The Meta 9’s connection piece is much more stiff. So, it gives it that single piece power but still the sting dampening of a two piece composite. Note, as well, the Meta 9 will ONLY come in a BBCOR sizes. Expect the 919 in USA, USSSA and a wide range of BBCOR sizes. The 919 Prime from Slugger is a two piece composite bat. Meaning, the bat’s barrel and handle are constructed separate and then put together post production. How a bat connects its handle to its barrel considerable affects its performance and feel. Slugger’s connection is know for a real great feel on both good and bad hits. It is not a terribly stiff connection. Which, of course, has its downsides too in that you might loose some power on off-center hits. We liked the 918 Prime in BBCOR so much because it came in a great range of sizes. Especially in BBCOR. It was one of the only composite BBCOR bats you could find in shorts like a 30. Expect the same generous sizing options in the 919 prime. That is, short USSSA and BBCOR options. Maybe most noteworthy, the 2019 919 Prime will come in a USA Bat version also. This is big news for Slugger fans who spent much of last year looking for a high end USA Bat but couldn’t find a slugger option (although the 718 did just fine). This bat makes me very disappointed. I’ve been swinging the 917 and I love it but after a while I needed an upgrade so I got the 919. It is honestly terrible the 917 has way more pop and has a smoother swing. The 919 makes you have a jerky swing as it is slightly endloaded. I did swing end loaded bats a little last year and swung well but the 919 does not fee right. If you barrel up the ball the bat feels excellent but it’s hard to do with the weight distribution.